Mid-Week Musings has been missing from this blog for quite awhile, but don't worry it's finally back! If you were wondering why i stopped for awhile, it's cos Kaitlin is such an active one, it's quite hard to capture all her funny and cute moments. I wish I could capture everything down, for memory sake, but well, kids just move too fast, and I just can't keep chase. Kaitlin has been showing me all sorts of funny faces whenever I try to take a picture of her and I wanna share them with you! Yes. She is indeed putting her finger into her nose. She loves to do it. 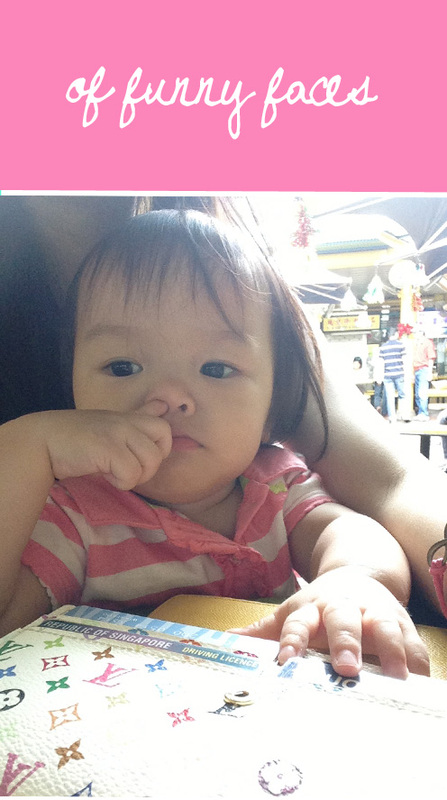 She will poke her finger into her nose, my nose, Daddy Li's nose -.- Sometimes she even pokes it into her mouth after that. Fret not, I do stop her. It's so unhygienic I can't stand it sometimes. I don't know why she enjoys doing it when there is no dirt in her nose, but well I guess to her it's a game. I really hope she doesn't grow up to be a nose-picking kid that picks her nose in public and smears her booger everywhere! These two photos were taken just after she woke up from her nap. I wanted to just take a normal smiley photo of her, but she ended up giving me these funny faces! Couldn't stop laughing after that I had to send Daddy Li the photo to see and he thought I tried to scare her or something hence her expression. FYI, I really didn't okay. I was just simply taking a photo. These were taken when we were waiting for Daddy Li to cut his hair. I bet she's like thinking "What's taking so long!" and "Why are you making me wait! I want to go to the playground already!" I can totally imagine her saying that.